The first thing we do is negotiate with our distributors and manufactures to offset prices. Remember that the distributors "eat" much of the cost so that restaurants can keep prices as low as possible. Once we have done our due diligence here, we have to look at the portion sizes of entrees served. Many years ago, a common entree portion was 6 ounces. In 2008, we moved to a 5 ounce portion which was a direct response to that time dealing with high energy costs, Hurricane Ike, and the recession in the same year. (One of the most challenging years of my career) Yes, we have begun looking at 4.5 and 4 ounce portions for the upcoming year... Remember, it is all you care to eat. If we are still challenged with maintaining costs, the next thing is limiting offerings and changing the menu mixture to those items that are affordable while maintaing the quality you expect. Quality is the very last thing that would be compromised in our matrix. If we are faced with a catastrophe of the economic variety, we certainly would have to look at lower cost ingredients which typically translates to a lesser quality. I do not expect it to come to this anytime soon. There are many creative ways to offset costs without compromising quality and our chef's are masters at this! A word about 2011... We are now facing the same energy increases we experienced in 2008 with a dim economic forecast moving forward. Primarily, the supply of food and ingredients is looking to shrink and therefore raise costs globally. A word about the radiation in Japan... This is a new development and experience in our careers and we don't fully know yet the impact it will have on the global market. We are starting to hear about contamination of the seafood in Japan and recently, in Oregon, dairy is being affected. Although I am optimistic, we must be diligent. The West Coast and California supplies 80% of the "in-season" produce for the entire nation... Imagine the impact if this market were compromised. I am wholly optimistic that we will stay true to form offering high quality food and creative menus, but remain cautious and diligent to fluxes in the market. We are doing what we can... What can you do to help us? 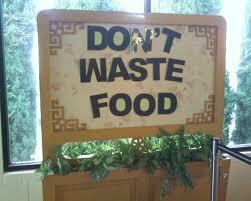 Above all, limit your plate waste. Please take what you would like, but eat it... Take smaller portions and return for seconds if that helps. This economic problem is not going away soon and we are all part of the solution working together.